The dress code for this year’s Met Gala, the short name for the Metropolitan Museum of Art Costume Institute’s annual benefit, was supposed to be experimental and hip. After all, the current Costume Institute exhibition honors Rei Kawakubo, the Japanese designer behind avant-garde fashion house Comme des Garçons, which she founded in 1969. Only the most daring fashion souls actually wear head-to-toe Comme des Garçons. Some of her garments don’t actually look like something a stylish person would (or should) wear. So the stage was set to see which famous folks would have the courage to wear Kawakubo’s designs on this year’s red carpet. The answer? Not many. But those who did — Rihanna, Tracee Ellis Ross, Maxwell, and Pharrell Williams’ wife, Helen Lasichanh — are definitely not what you would call shrinking fashion violets. The Met Gala, once a lily-white, insiders-only affair for people in the fashion business, now attracts a hugely diverse set of attendees. The event is superpricey (tickets go for $30,000 each, and tables run to $275,000), the guest list is very exclusive, and the red carpet tends to encourage the kind of damn-the-torpedoes fashion chances that celebs used to take. La La Anthony attends the “Rei Kawakubo/Comme des Garcons: Art Of The In-Between” Costume Institute Gala at Metropolitan Museum of Art on May 1, 2017 in New York City. The MVP award goes to actress and mother La La Anthony. Last month she announced a surprise separation from NBA superstar Carmelo Anthony amid infidelity rumors, but last night she issued a fashion smackdown via Instagram to the world and perhaps her estranged husband (and former Met Gala date): “Unbreakable” is the caption. Anthony’s sheer, long-sleeved black gown just put designer Thai Nguyen Atelier on the map. Jennifer Lopez and Alex Rodriguez attend the “Rei Kawakubo/Comme des Garcons: Art Of The In-Between” Costume Institute Gala at Metropolitan Museum of Art on May 1, 2017 in New York City. Making their official red carpet debut, newly minted power couple A-Lo (or J-Rod, which sounds slightly naughtier), brought old-school Hollywood glamour to this year’s Met Gala. The retired Yankees slugger Alex Rodriugez stood by as Jennifer Lopez shined in a full-on baby blue princess gown by Valentino. A-Rod was careful to avoid stepping on J-Lo’s dramatic train. Offset, Quavo and Takeoff of Migos attends the “Rei Kawakubo/Comme des Garcons: Art Of The In-Between” Costume Institute Gala at Metropolitan Museum of Art on May 1, 2017 in New York City. 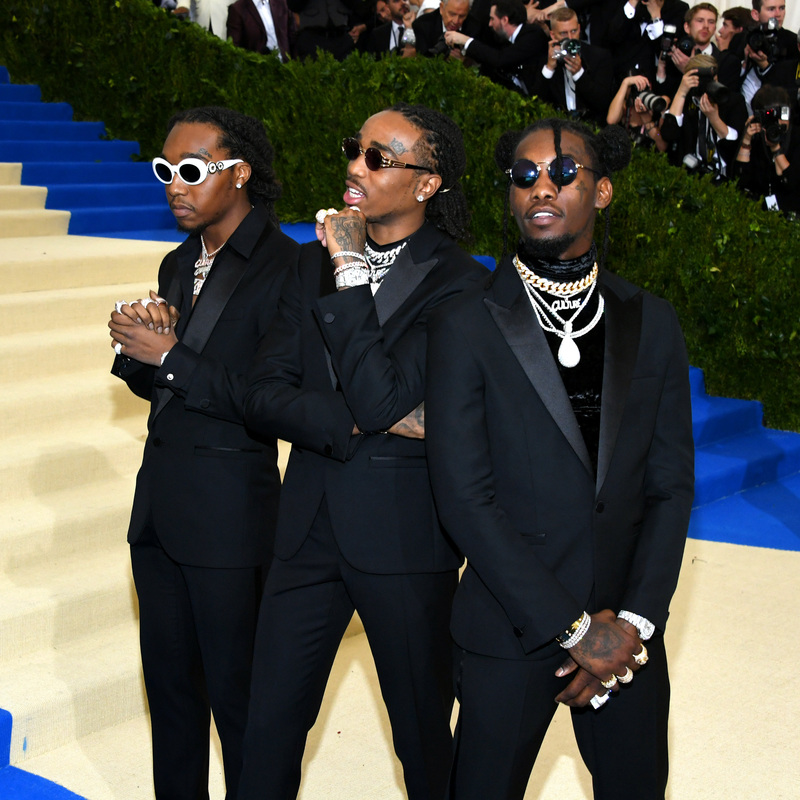 Quavo, Takeoff and Offset apparently know the secret to winning the Met Gala’s red carpet. All three looked fearless in matching Versace suits, sets of glittering rings, and blinged-out bracelets and watches. One of Quavo’s chains was the bust of Yoda. While the looks were relatively safe for their first go-round at the Met, they were still out here looking bad and boujee. Rihanna, Tracee Ellis Ross, Maxwell, and Pharrell Williams’ wife, Helen Lasichanh — definitely not what you would call shrinking fashion violets. Lupita Nyong’o attends the “Rei Kawakubo/Comme des Garcons: Art Of The In-Between” Costume Institute Gala at Metropolitan Museum of Art on May 1, 2017 in New York City. Oscar-winning actress Lupita Nyong’o is a bona-fide red carpet star. Last year, her striking hairdo was a tribute to singer Nina Simone and African sculpture that complemented her green jewel-toned gown. This year, the Yale grad switched it up for a bold orange, off-the-shoulder dress with floral plumage at the bust by Prada. She paired it with Tiffany & Co. jewelry. Rihanna attends the “Rei Kawakubo/Comme des Garcons: Art Of The In-Between” Costume Institute Gala at Metropolitan Museum of Art on May 1, 2017 in New York City. 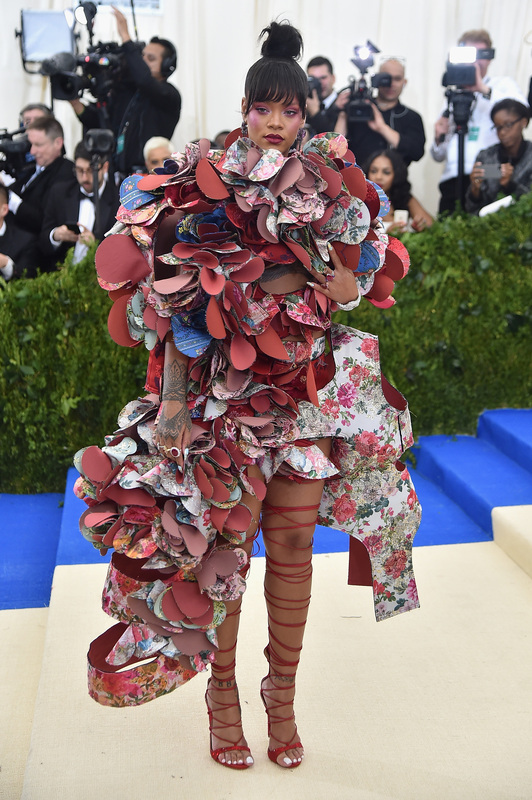 Rihanna always comes to the Met Gala in theme, but never looking cartoonish or Halloween-y. This year she wore a floral gown from the fall 2016 Comme de Garcons collection. She paired it with magenta eye makeup and a topknot. But she is no stranger to slaying the red carpet. At the 2015 gala, she infamously donned a couture Guo Pei gown for the Met’s “China: Through the Looking Glass” theme. Mary J. Blige attends the “Rei Kawakubo/Comme des Garcons: Art Of The In-Between” Costume Institute Gala at Metropolitan Museum of Art on May 1, 2017 in New York City. Serena Williams attends the “Rei Kawakubo/Comme des Garcons: Art Of The In-Between” Costume Institute Gala at Metropolitan Museum of Art on May 1, 2017 in New York City. Williams debuted her lovely pregnant belly along with her fiance, Reddit co-founder Alexis Ohanian. Her emerald-green halter dress had a romantic mermaid hem flourish. Kim Kimble, hairstylist to the Bronx-born Blige, gave her blonde tresses an edgy cut with a high, swooping top. The black lace gown was by La Perla Haute Couture. Zoe Kravitz attends the “Rei Kawakubo/Comme des Garcons: Art Of The In-Between” Costume Institute Gala at Metropolitan Museum of Art on May 1, 2017 in New York City. Zoe Kravitz was giving debutant goddess vibes in a pink-and-black satin Oscar de la Renta column. But the Mad Max: Fury Road star let her short platinum pixie cut speak for itself. The daughter of Lisa Bonet and Lenny Kravitz always rocks a millennial hip-girl appeal.